One of the things my kids could always count on when they come from school is finding homemade sugar cookies in the big blue cookie jar in my old kitchen hutch. These cookies are very special, they have my blog signature. What would you write on your cookie? Preheat an oven to 375°F. Line two baking sheets with parchment paper. 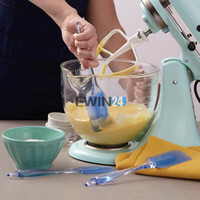 In a large bowl, using an electric mixer beat the butter on medium speed until creamy. Add about half of the flour mixture, and beat until blended. Add the vanilla sugar, egg yolk, honey and beat until smooth. Beat in the remaining flour. Chill the dough for about 15 minutes. Shape the dough into 1-1 1/2 inch balls. Place them 2 inches apart on baking sheets. You will have 6-8 cookies per sheet. Using a floured cookie stamp or flatten balls to 1/4 inch thickness. Trim uneven edges with a round cookie cutter. Bake the cookies until the edges are light brown, about 8 minutes. Transfer the baking sheets to wire racks and let the cookies cool briefly on the sheets, then transfer the cookies to the racks and let cool completely. For these cookies, you will need the Customizable Cookie Stamp to create your own messages. Cute cookies. They must taste wonderful. Your Melangery stamped cookies look delightful. I'd be inclined to imprint mine with: Yes, please! Absolutely loved the stamping on cookies idea!!! Got to get one …thanks for sharing!!! These cookies are so incredibly charming and sweet. Dear Yelena..you will never believe what I just received.. 2 of these..one for a friend..and one for me.. I loved the idea that it was different from all my other ones.. I do LOVE your Christmas ones too though..
Wow, that's so cool, Monique-))) and thank you for the recipe! Honey and vanilla..these cookies sound very good! They are so cute*_* Honey and vanilla is a great combination! So very cute! I have to get the stamp! Love the photos! First of all, your blog is beautiful. And your photos are amazing. I made these cookies when you first published this recipe. My family and friends loved them. I keep your posts in my email for reference and I just had to find this recipe for a cookie exchange this weekend. As I had printed it the first time and we moved and I can't find my recipe binder. There's a reason why I keep your posts in my mailbox, and now I saved it to Pinterest. Thank you for your beautiful, classic style and your amazing recipes. You have a follower forever. Thank you Ellie for your warm comment, I am happy to have you here in my little culinary and photography world-)) The cookies are delicious, I definitely need to make them again, and they so much fun to make-)) You have a wonderful holidays and I am wishing you the best! !